[Jeremy Blum] recently finished writing a couple of software packages for his SudoGlove system that turns it into a music controller with a lot of features. We’ve seen the hardware in a previous post and as a goal for this iteration he decided not to alter the hardware or the firmware controlling it whatsoever–making this a PC-side software only hack. It’s nice to see improvement on the original ideas as we feel most of the glove-based projects we’ve covered end up getting thrown in the junk box after the developer’s interest wanes. After the break you can see and hear a demonstration of the complete system. 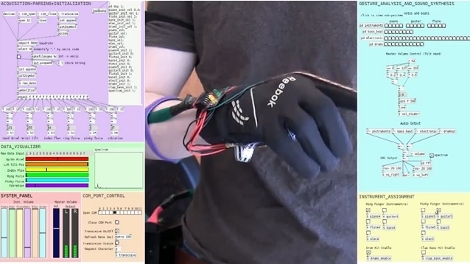 The front end of application shown was written using Processing and includes a slew of user configurations for each sensor on the glove itself. Under the hood [Jeremy] built on the PureData framework in order to really unlock the potential for translating physical movement into synthesized sound. There is also a visual feedback application which will help you practice your movements, important if you’re giving live performances where each finger is a different instrument. Everything for this project, both hardware and software, has been released under a CC license so check out [Jeremy’s] site if you’re interested in building on part or all of the good work he’s done. Update: [Jeremy] wrote in with a bit of a correction for our synopsis. The application shown in the video is written entirely in PureData and the visual debugger was written with Processing. The two are standalone packages that don’t depend on each other. He also sent us a link to download the code packages. Nice work Jeremy and great videos! I can see this getting further development and turning into a really cool and versatile interface. No.. You use the cape for that. And put your underwear on the outside. …. You do know about the cape.. Yes? This is awsome! It kinda reminds me of The Boys! and Crash… I want 6 of these, ima start a band with them! Jeremy, can I buy some of these from you? I’m not selling any right now, but I do intend to develop a version 2 at some point. All the plans on on my blog if you want to build one.